Ordinary Decent Criminal Album reviews. It seems to be all the rage for the big rock stars to get heavily involved in movie soundtracks these days. At one time, it was enough for a band to contribute a single track to a film, but now they are writing all the original score and dedicating plenty of time to their picture projects. First there was REM and the Man On The Moon soundtrack, then came Bono and his writing for The Million Dollar Hotel. 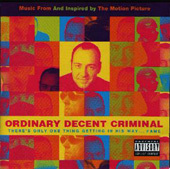 Joining the trend is Blur's Damon Albarn, who has inputted a great deal to the soundtrack for the new Kevin Spacey film, Ordinary Decent Criminal. The three new vocal tracks Albarn gives the album are joy, following in the style of Blur's creative 13 CD, experimental strings and all. "One Day At A Time" and "Kevin On A Motorbike" will be popular with all Blur fans, while "Dying Isn't Easy" is a cracking final number, complete with gospel choir, a la "Tender." Albarn's instrumental scores are as good as any experienced movie composer, while further delights can be found in Yma Sumac's 1954 Latino classic "Gopher Mambo" and a new Bryan Ferry track, "Mother Of Pearl." But the most significant milage that turns the Ordinary Decent Criminal soundtrack into an extraordinary, decent album is run by Albarn, both creative and inspirational here.Once again, Damon Albarn's touch transforms a project into gold, and his venture into the world of movie soundtracks is certainly as good as any of the major rock stars that preceded him.